Are Badly Worn Doors Costing You Money? Badly worn doors are more than just an eyesore, they could be costing you major dollars in lost energy savings. Find out how. As long as your door still opens and closes, there is not a problem – right? Unfortunately, this is a major misconception among homeowners. Doors have many additional responsibilities that go beyond just letting people in or out of your home. Your neglected and ignored door could be costing you money. Why Do Doors Need to Be Replaced? 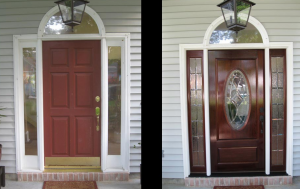 It is easy to overlook just how much wear and tear doors experience in a short amount of time. Every day, they are opened, closed and sometimes even slammed shut. This takes a toll on the hinges, weather stripping and many other pieces of the entryway. The door also faces the elements, which is what causes the bulk of the damage. Depending upon where you live, your door comes in contact with rain, UV rays, sleet, hail, wind and many other elements that constantly wear away at the integrity of the materials. Over time, the door can become cracked, dried out or otherwise unable to provide a secure and cohesive barrier for your home. How Are They Costing You Money? Okay, so your door has a few cracks here and there because of weather damage – is this really important? These openings allow substantial amounts of air to leak in and out of your home, and this uncontrolled airflow leads to the loss of energy for your house, as well. When you have drafts caused by worn and damaged doors, this makes it much more difficult for you to efficiently heat and cool your house. Your heating and cooling equipment has to work overtime because all of the warm or cool air is being affected by these unwanted openings. Replacing the door can lead to a home that is much more comfortable, and monthly energy bills that are substantially lower. Whether you are planning to sell your house, or simply want to improve the external design of your property, a new door can have a major impact. The door is the gateway to your home, and will help visitors make their first impressions of your house. Welcoming people with an old, worn out door is not going to send a positive or inviting message. When selling your house, one of the simplest ways to greatly increase curb appeal, possible enticing more buyers, is replace your old door. A new, polished and attractive door can become an appealing focal point that draws in viewers and potential buyers. Especially if you have already spent the time and energy to improve your landscape, it is important to lead your guests to a door that helps tie the overall look together, helping them to feel like they are home. If your door is damaged, you may be tempted just to patch the problem areas and make repairs instead of replacing the entire door. This may make a small improvement to your energy efficiency, but the results are not going to be nearly as favorable as what you would experience with an entirely new door. The Residential Energy Services Network explains that repairing your door can be problematic because, over time, the shape of the door and the doorframe will shift and change, making it difficult to complete an effective repair that creates an energy efficient seal. Another advantage that comes with replacing the door is that new doors are being made out of increasingly durable and energy efficient materials as these qualities become more important for homeowners. The new door that you choose for your home can be both aesthetically pleasing and insulated to provide maximum efficiency.